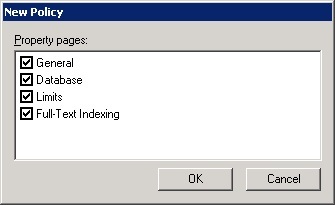 With Exchange 2003 installed I first wanted to change from mixed mode to Native Mode. This is done by right-clicking the organisation in ESM, and choosing Change Mode. Next, I went into recipient policies and the properties of the Default Policy. Here, I added @msgeek.co.uk and set it as Primary. 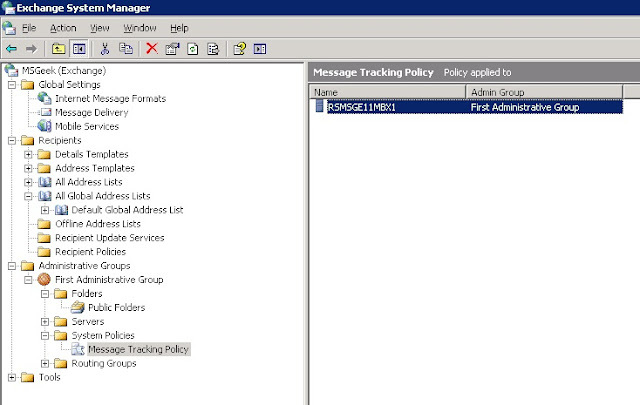 Next I went into the First Routing Group, and chose to create a new system policy container. From there I chose to create a new Server Policy. 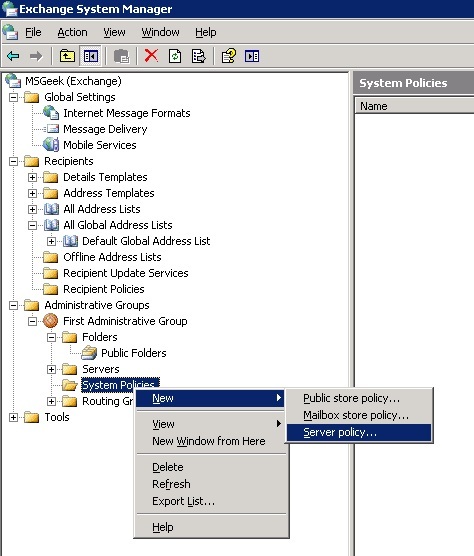 These policies allow simplification of management across multiple servers / stores. The only properties that can be managed by policy at the server level are properties on the General Tab (specifically Message Tracking). 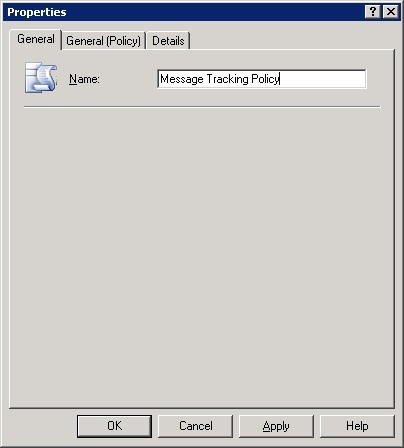 Because of this, I named this policy "Message Tracking Policy". 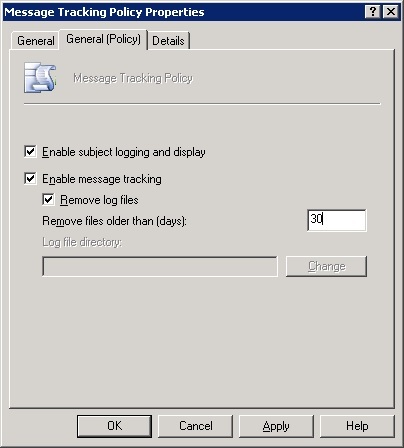 On the General Tab, I enabled subject logging and message tracking, and, as I'm not expecting any real load on this lab setup, set log files to be removed after 30 days. For a production system you will want to get a better idea of log generation rate and place the logs on a drive with enough space. Allow for a fair amount of overhead as loop emails or similar problem messages can significantly increase the space used unless they are identified and stopped very quickly. 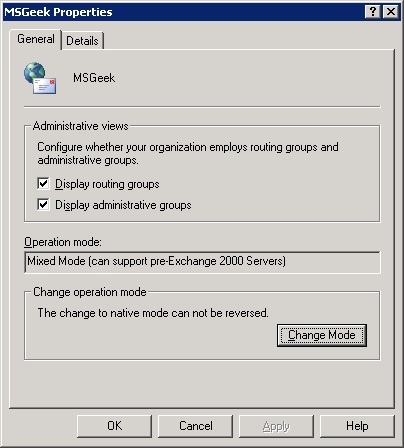 After that, I added the Exchange 2003 Server (RSMSGE11MBX1) to the policy. Next I created a new Mailbox store policy, and added all available property pages. I was happy with all of the default settings aside from those on the Limits tab and the maintenance window on the Database tab. Despite this, I'd still recommend adding all property pages to policies, as this disables those settings on a per database basis, meaning there is less scope for misconfiguration, and allows better visibility of settings that can only be configured on a per database basis. 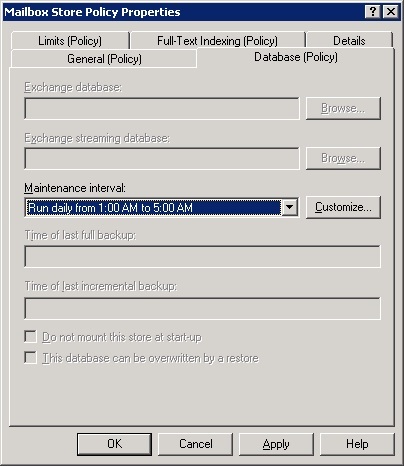 If you have large numbers of databases per server you may want to look at setting up multiple policies with different non-overlapping maintenance windows for databases on the same disk to optimise performance. On the database tab I modified the Maintenance interval to run from 01:00 to 05:00. 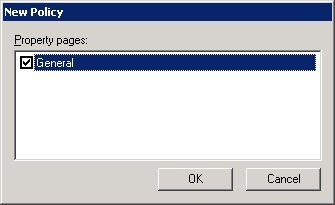 On the limits tab I set issue warning at 950MB, prohibit send to 1000MB and prohibit send and receive at 1050MB. That's fairly tight limits compared to what you'd expect these days, particularly with Exchange 2010, but the reasoning is twofold. 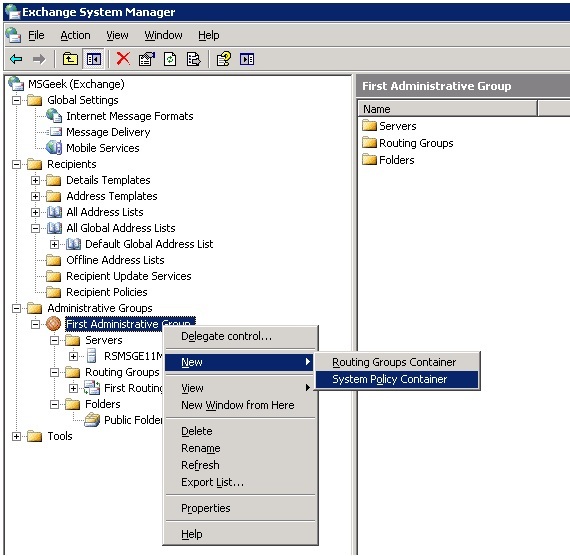 Firstly there's not going to be much aside from test contents in the mailboxes, and secondly, Exchange 2003 won't set limits above 2GB (specifically 2097151KB) using ESM or the Active Directory properties pages, so it saves me from having to poke around in ADSIEDIT. I also upped the deleted item retention to 30 days and deleted mailbox retention to 30 days and enabled the function to prevent permanent item deletion before the store has been backed up. I find having a consistent time frame for message tracking and deleted item and mailbox retention makes explaining options about exactly what can be done about that missing email to non-technical users much easier. Next, I wanted to sort out the horrible way that Storage Groups and Databases are named by default. Having Storage Groups follow the pattern of First... Second... etc becomes a nightmare to manage as the org grows, same with databases. 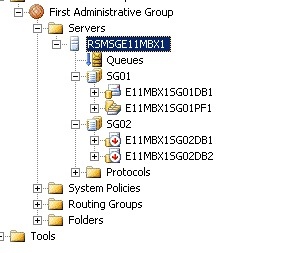 As a general management tip I'd recommend keeping database names unique in the org, but Storage Group names can be repeated across servers. Having database names that would sort alphabetically into some logical order across all Exchange versions is also a bonus. In the screenshot above, I have renamed the First Storage Group and the Mailbox Database and public folder Database it contained to something a little more manageable. 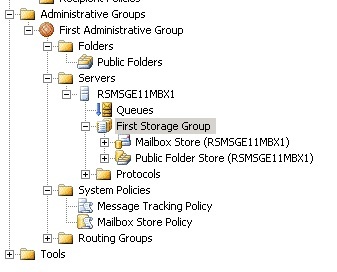 I have also added a second Storage Group, naming it SG02, and added two mailbox databases to it. (Although I have yet to mount them). To assist with the creation of the additional Storage Group and Database I created the folder structure below on the 50GB Data drive. Next I wanted to correct the names and locations of the mailbox and public folder databases that were created during the installation. By default these were placed in the installation directory on the system disk. The corrected names and locations are shown below. 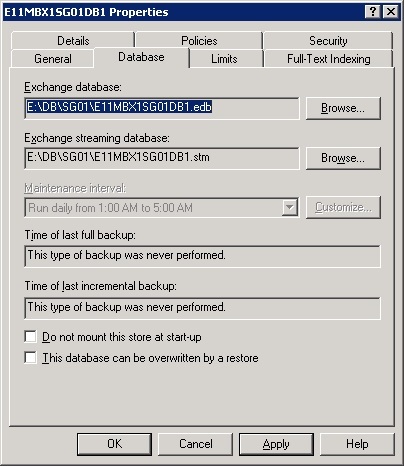 Applying this change causes exchange to dismount the databases, move the database files and re-mount them, so the smaller the database when this is done the better, in this case there's practically nothing in the database so the change was fairly instant and completed successfully. After making the same name and location changes to the public folder database, I added the three mailbox databases to the policy I created earlier. 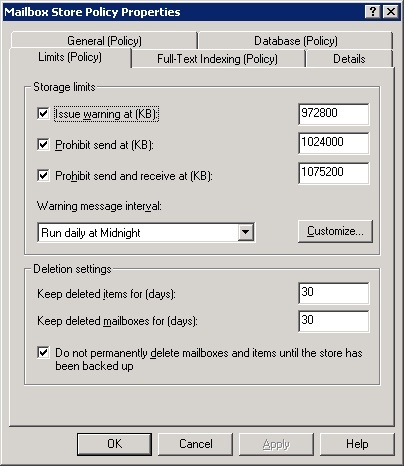 I then created a Public Folder Database Policy, with basically the same settings as the Mailbox Database policy and assigned the single Public Folder Database to it. 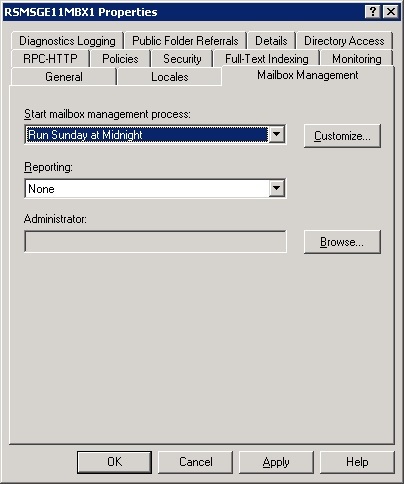 I then mounted the two additional databases in SG02, and went into properties at the server level, and configured the mailbox management process to run every Sunday at Midnight. 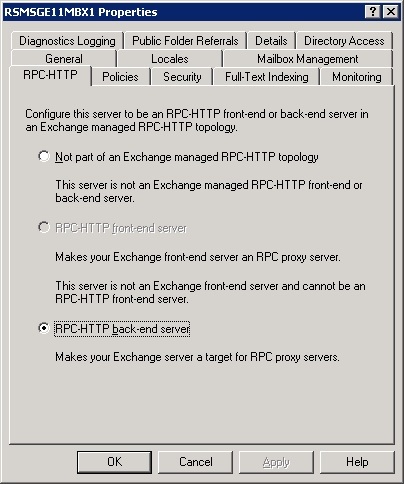 Then, on the RPC-HTTP tab I changed the setting to RPC_HTTP back-end server. There's still a fair amount to do as far as configuration goes so I think I'll split it into a second post.